Image: Epworth HealthCare Chief Medical Officer Luis Prado, Professor of Medicine Miles Prince, Minister for Health Greg Hunt, Executive Director Freemasons and Richmond Nicole Waldron and Group CEO Lachlan Henderson at the recent Pharmaceutical Benefits Scheme (PBS) announcement at Epworth Richmond. An Australian global clinical trial led by Professor Miles Prince AM has seen a breakthrough drug being added to the Pharmaceutical Benefits Scheme (PBS). 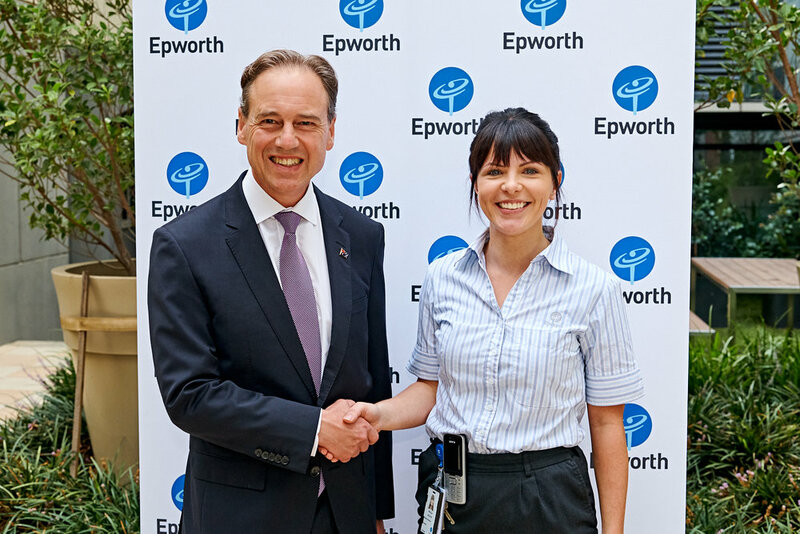 Federal Minister for Health Greg Hunt announced recently at Epworth Richmond that crucial medicines for Cancer, Parkinson's and motor neurone disease will be listed on the scheme as at 1 April 2019. The Federal Government will invest $19 million to broaden the PBS listing of Adcetris® to include the treatment of a rare cancer called cutaneous T-cell lymphoma, Xadago® listed to treat Parkinson’s disease and Teglutik® for the treatment of motor neurone disease. Adcetris® as a treatment for skin lymphoma was studied as a part of a large international clinical trial. This study was published in the Lancet, with Professor Prince as lead author. Professor Miles Prince said that after 6 years hard work, it was astounding that Adcetris® could now be prescribed to patients. Adcetris® has proven to be effective and well tolerated in patients who require systemic therapy to control their disease. This is an important treatment option for Australian patients who are at a difficult stage of their disease. I am proud to be part of the Epworth team which is absolutely the best place to receive the most innovative, leading options in care, which will give patients the best hope of successful treatment. An internationally recognised haematologist, the Director of Molecular Oncology and Cancer Immunology at Epworth HealthCare, Professor Prince has been involved in numerous clinical trials of new therapies for blood cancers and a part of more than 100 clinical trials involving myeloma, lymphoma, leukaemia, transplantation and supportive care. He has an incredible team of people working on different trials who are the next generation of great innovators in treatment. As a part of the announcement, the Minister toured the oncology ward at Epworth Richmond to meet with some Epworth patients and was joined by patients and their families in the courtyard afterwards. Group CEO Lachlan Henderson, Executive Director Freemasons and Richmond Nicole Waldron and Chief Medical Officer Luis Prado, representatives from the pharmaceutical companies as well as Rare Cancer Australia and Lymphoma Australia were also present.